On a recent two-day trip to Singapore, I only had enough time to for one gourmet meal what with doctor’s appointments, errands and buying party favors for my daughter’s 3rd birthday. In the midst of running around Orchard road, I managed to squeeze in a quick late lunch with my cousin D. We agreed to meet at Mandarin Gallery’s famous ramen restaurant, Ippudo. 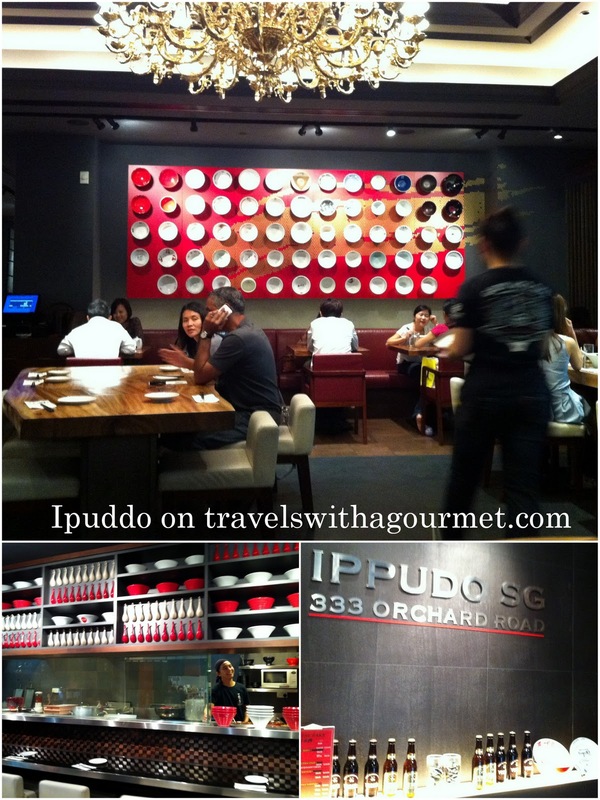 The original Ippudo opened in 1985 in Japan by Ramen King Shigemi Kawahara making their signature tonkotsu ramen soup. I had read good reviews about this noodle place and also heard that since they don’t take any reservations, lines snake out the door at lunch and dinner and especially on weekends which is why I never attempted to just walk in at 6:00 p.m. This time, it was a 1:30 p.m. on a Monday so there was no wait although we had to share our large round table with three others. Interiors are sleek with red, white and wood accents throughout. There is a noodle bar right by the open kitchen, three communal tables and several smaller tables scattered in the main dining area. The menu is simple but extensive – ten appetizers, a few salads, several small main courses and rice and finally, ramen. There are three types of noodles varying in toppings and broth with a small selection of other toppings you can add on to your noodle order. We started with the Ippudo pork bun which is similar to the Chinese char siu pao. Theirs is a rectangle instead of round steamed bun filled with slices of roast pork and a special sauce. This was delicious and so addicting that I had it all and was about to order three more but since we had a few more appetizers and the noodle soup coming, I didn’t. 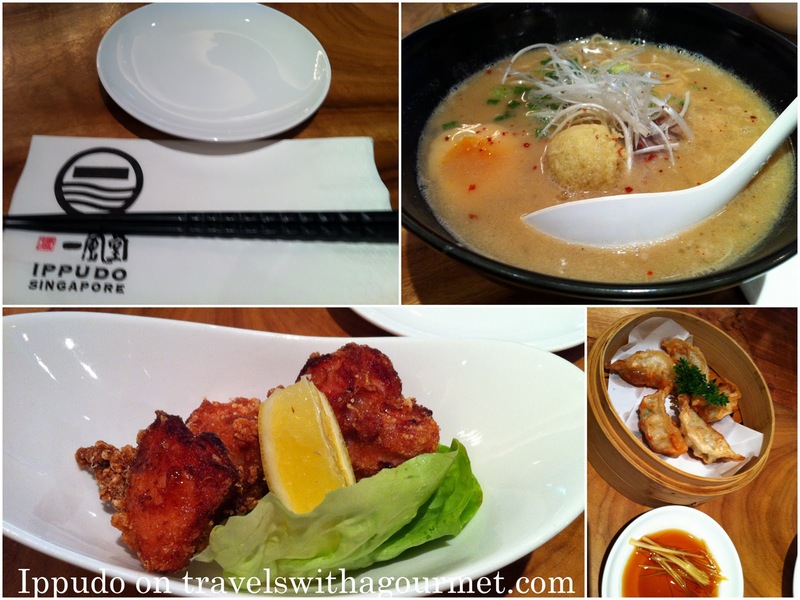 We shared the yummy tori karaage – crispy fried chicken pieces which came just with a sliver of lemon and a bamboo basket of fried gyoza – meat filled Japanese dumplings which came served with black vinegar soy and ginger. Our large bowls of soup came after. We both had their Akamaru Kasaneaji which is their original recipe tonkotsu soup flavored with miso, garlic oil, simmered pork belly, flavored egg and thin noodles. They also asked us how we’d like our noodles, a first for me, soft, medium or hard (a.k.a. al dente). The broth was flavorful, the pork tender, the egg runny and the noodles just right. I managed to finish my noodles, the toppings and almost had all the broth as well. This was the best ramen I’ve ever eaten and although I haven’t been to Japan (I’ll be visiting Osaka and Tokyo in November), this was so deliciously different from the other ramen I’ve tried that this goes on my best list immediately and I’m definitely making this a regular stop when I’m in Singapore. *Open Mondays to Saturdays from 11a.m. to 11 p.m., last order at 10 p.m.
*Open Sundays 11a.m. to 10 p.m., last order at 9p.m. *Open for lunch Mondays to Thursdays 11:30 a.m. to 3 p.m., last order at 2:30 p.m. and Dinner from 5:30 to midnight, last order at 11 p.m.
*Open for lunch Fridays to Saturdays 11:30 a.m. to 3 p.m., last order at 2:30 p.m. and Dinner from 5:30 p.m. to 2 a.m., last order at 1 a.m.
*Open all-day Sundays from 11:30 to 11:00 p.m., last order at 10 p.m.